CRM-100™ Guide | International Medcom, Inc. Thank you for purchasing this high quality Geiger Counter. With proper care it will provide you many years of reliable performance. The instrument is ready to use when it comes out of the box. A 9 volt alkaline battery is already installed. This battery will operate the instrument continuously for at least 7 weeks at normal background radiation levels. A low battery indicator will appear on the LCD when the battery needs changing. Turn the instrument ON. You will now see the red LED flash occasionally, indicating radiation is being detected. In AUDIO mode you will also hear a beep each time radioactivity is detected. Put the mode switch (above the OFF-ON-AUDIO switch) in the CPM (Counts per Minute) Mode. Normal background radiation from outer space and the earth will always be present at the rate of 10 to 75 CPM (Counts per Minute). The count rate will vary with altitude and mineral content in the earth. The detector, a high quality Geiger Mueller tube, is locate behind the screen on the top of the instrument. Alpha and beta radiation can be detected through the screen. The window of the detector is made of mica and is delicate, so please handle with care. When you turn the instrument on you will see the LED blink when a radioactive “event” is detected. In Audio mode you will also hear each event. Your ear will be able to detect changes in the count rate as you move closer to, or away from, radioactive sources. For measuring gamma radiation use the mR/hr or µSv/hr modes of operation. The instrument is shipped from the factory in mR/hr mode. To switch to SI units (µSv/hr), please us the Utility Menu (more on this below). The instrument is calibrated for gamma radiation from Cesium 137. For measuring mixed alpha, beta and gamma radiation, use the CPM (Counts per Minute) mode. This will give you a relative reading of all radiation combined. 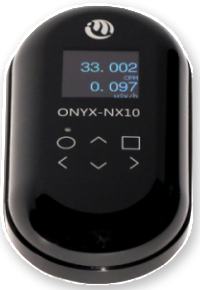 For complete specifications on the instrument’s sensitivity to various types of radiation please go to CRM-100. To detect subtle changes in radiation levels, use the Total/Timer function. The + and – buttons allow you to set a period of time for measuring radioactive events. Push the Set button to start counting. Counting for long periods, 5 hours or more, will provide best results. Compare total count readings from location to location, or find a stable background level at one location and then compare results with various sources of food or household items. Switching between mR/hr and µSv/hr: Utility Menu is accessed by pushing the + button while turning the instrument on. The instrument will display “Menu 1.” Press the + button again to advance to “Menu 2.” Press Set to enter Menu 2. You can now scroll between mR/hr and µSv/hr. Select the units you would like to use and then press “Set.” Turn the instrument off and then on again to activate the new setting. What Radiation Level is Normal? Radiation levels vary with altitude (usually higher as elevation level goes up), and with soil mineral content, and other factors. In an airplane, radiation levels can get quite high due to cosmic rays from outer space that typically are shielded by the upper atmosphere. Radiation levels on ground at sea level are typically in the range of 10 to 50 CPM, 0.01 to 0.05 mR/hr, 0.1 to 0.5 µSv/hr. Radioactive materials in the earth, natural or man-made, will contribute to higher levels. This product is warranted to the original owner to be free from defects in materials and workmanship for two year from the date of purchase, except for the Geiger tube, which is warranted one year. The battery is not included in the warranty. IMI will repair or replace your instrument if it fails to operate properly with this warranty period provided it has not been subjected to misuse, abuse, or neglect. Modification or repair of this instrument by anyone other than IMI or their approved repair facility voids this warranty. IMI is not responsible for incidental or consequential damages arising from the use of this instrument. Contamination of the instrument with radioactive materials voids this warranty. Contaminated instruments will not be accepted for servicing at our repair facility. The user is responsible for determining the usefulness of this product for his or her application.